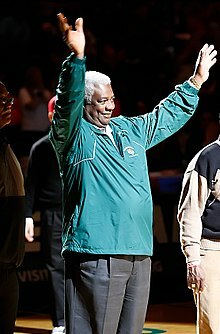 Oscar Palmer Robertson (born November 24, 1938) is a retired NBA basketball player. His nickname is the Big "O". He played at the guard position for the Cincinnati Royals from 1960 to 1970 and for the Milwaukee Bucks from 1970 to 1974. He is in the NBA basketball's Hall of Fame. Robertson won an NBA championship with the Bucks in 1971, and won the NBA's Most Valuable Player award in 1964. He was also named to the All-NBA First Team nine times, and was an NBA All-Star twelve times. ↑ basketball-reference.com. "Oscar Robertson stats". Retrieved 2007-01-25. ↑ "NBA.com: Oscar Robertson Summary". www.nba.com.